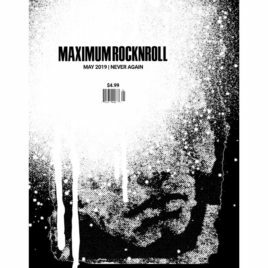 Maximum Rocknroll #432, our final monthly print issue, features PIÑÉN, CHRONOPHAGE, PROVOKE, APSURD, Palestinian Solidarity + Punk, Israeli Punk Archive + JARADA, Jesse Ponkamo photo spread, Winston Smith, CIEMO, EXOTICA, Kim Garcia, DREAM NAILS, Faith/Void, Greek photo spread, BUSH TETRAS, DESEOS PRIMITIVOS, SUSAN, THE WORLD, Louder Faster Shorter filmmaker Mindaugas Bagdon, FORRA, KHIIS, Interfaith Works, and a Rio Grande Valley scene report. Cover art by Martin Sprouse. 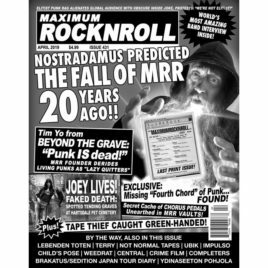 Maximum Rocknroll #431 features actual predictions, ghosts, hoaxes, scandals, thievery, and revelations! ALSO: Portland’s LEBENDEN TOTEN, San Francisco’s First and Only Rock ’n’ Roll Movie: CRIME 1978, TERRY from Melbourne, Australia, YDINASEETON POHJOLA from Finland, Brazil's COMPLETERS, WEEDRAT from the Navajo Nation, Australia's UBIK, Chicago's Not Normal label, CHILD’S POSE from London, CENTRAL from Vladimir, Russia, Italy's IMPULSO, photo spreads from Karoline Collins and David Garcerán, and a photographic scene report from Belém, Brazil. (Details below.) This issue is also available as a PDF download HERE.